Home > My offside trap	> Red alert: Stancu’s on fire! Red alert: Stancu’s on fire! He scored 15 of Steaua’s 34 goals of the season, in all competitions. He’s the best scorer in Liga I, with 12 goals, scoring twice as much as he did in the entire previous campaign. Just for the record, last year’s most efficient striker, Andrei Crristea, netted just 16 goals to claim the golden boot award and miss transfers to high profile clubs like… Karslruhe. Let’s not go there, though, and stick to the 23 years old who has a number of high profile clubs following him, in spite of an asking price that should have reduced the interest in him, yet that strategy failed. Stancu is on fire and has produced such impressive numbers this season mainly because he goes for the spectacular goal only every once in a while – beware of his shooting ability from outside the box! – and used his agility, composure and eye for the goal to turn into goals mainly the passes that weren’t good enough for his colleagues or weren’t cleared in time by the opposition’s defenders. A look at his exploits will show that most of the goals scored this year came from close range, were simple tap-ins for those who fail to acknowledge the striker’s merits to be in the right place, at the right time. The lazy Tomcat turned into a fierce predator inside the box, yet the work done in the team’s interest before he reaches the penalty area deserves its share of praise. Liverpool fans should remember the assist offered for Tanase’s goal on Anfield, while the Romanian fans are in awe of his excellent first touch, intelligent movement and the ability to link-up play upfront and split the opposition’s back four open with either one of his passes or his sprints through the channels. He’ll be the man to watch tonight, in a team that will look different next year, unless Becali fails to keep it together and allow this strong group of players to gel during the winter break. The late arrival of “the Urziceni group” did more harm than good right away, mainly because it determined Lacatus to use a rotation system between the league games and those from Europa League and the coach failed to use it properly. He kept everyone involved, but the team rarely worked. A poor performance is expected tonight, as well, as Steaua’s probable first eleven speaks of a team that will be able to pose a threat only on counters, as the central pair from midfield looks more towards the defenders, not the forwards, and the wide players are out of form. 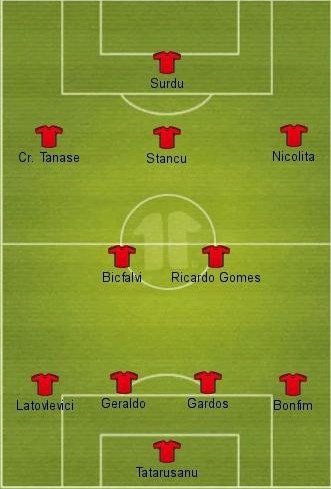 Not to mention that even if the odd decent cross should reach the box, Surdu is useless, while Stancu should enjoy a lot of attention from the Reds, as he’ll try to attack any empty space.